Our Royal Guard Pants are made from fine soft suede fabric and come in a wide variety of colors. The material used in the making of these pants replicates the look and feel of suede leather while eliminating the need for any complicated care procedures. It also ensures the material remains supple, like fabric should. Because these breeches fasten at the waist, they should always be ordered as close to fitting as possible. 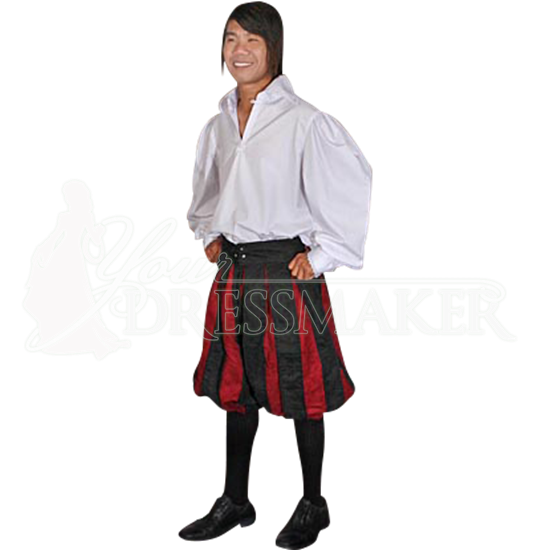 These breeches have knee-length legs that are quite loose fitting, although the hem of the leg is fitted just above the calf. These breeches feature a slashed stripe pattern. The main color makes up the waistband and half the stripes, while the accent color makes up the other half of the inner slashed stripes. 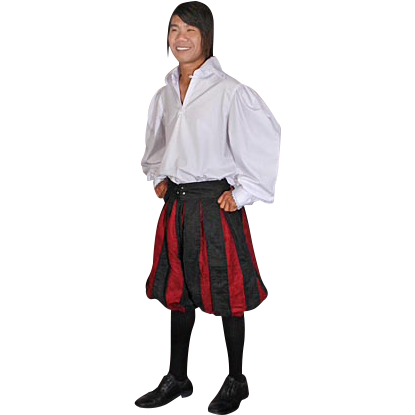 These Royal Guard Pants are a perfect match to our Royal Guard Doublet, although that does not mean that the two items are exclusive, mix and match as you please. The Royal Guard Pants can be used to complete virtually any outfit you desire. When ordering, the first Color dropdown menu is for the main color of the pants. The Accent Color is for the slashed stripes. For example, the main image shows the pants in Black with Red accents.